Within last few weeks, I’ve been to Bukit Tabur. 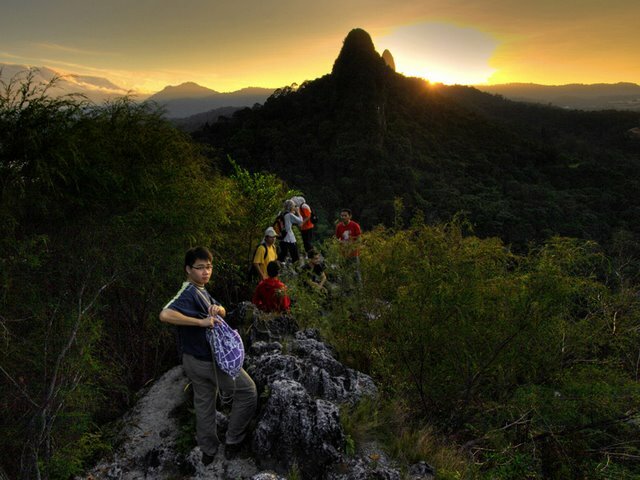 Could not find more time for long trip, other than usual rock climbing during weekends, and Bukit Tabur trip. It start with my colleague, who would like to try out some adventures during weekends. On 20th December, we start hiking the hill at 6.30, just 4 of us, because 5 others were late. We dont waste the opportunity to see the sunrise. Within 25 minutes, we arrive there. Its still dark, and we still have to use our headlights to walk. Then I returned back, and wait for the other 5 of us to arrive. We managed to reach the others around 7.30. Its not so hot yet, and we can still enjoy the sunrise that time. The trip was planned for only to enjoy the sunrise, but we could not hold ourself seeing other trackers moving with the passion to the top. I never reach the peak, the real peak, and neither all of us. We just follow some other trackers that time. Following few weeks, there comes another trip, for my other friends. They missed the 1st trip, because of health condition. Well, I keep my promise to bring them there 🙂 Its not as early as the previous trip, but we enjoy the trip, enjoy the sunrise, and enjoy the view from there. 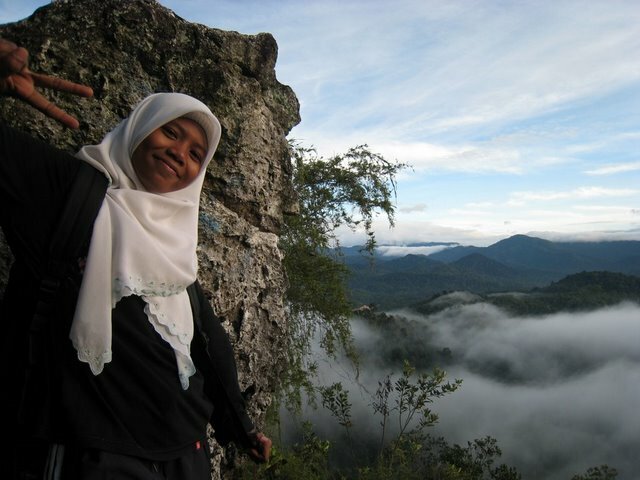 For last few trip to Bukit Tabur, I really want to just enjoy the view, and the cold winds. Its just feels like at the top of mountains, just with 20-30 minutes walk. Today I discovered a very slow loading of a few website of mine. For apache, I have reading through and made some tweaks and optimization to make it perform better. On database, not much that I’ve done. I use mytop, a mysql health monitor just like top in linux system. Its shows a few queries hanging and queued. Apache and mysql need a higher priority to serve the web faster, as fast as it could. I found a tutorial on renice, where we can change the process priority of process, and also for any process that belong to any particular user. The value varies from -20 until 19. The negative value only can be assigned by a superuser. The lower the value, higher the priority. For example, process with value -19, have a higher priority than a process with nice value -18. * this will change process httpd priority to 5. You can also change the priority by user. * This will change the priority of all process that belong to user mysql and with PID 8918 to -5. Yesterday I spent some time to play around with Monowall. Monowall is an embedded firewall package, thats built from bare-bone version of FreeBSD. The whole package is really small, smaller than 12MB, it can fit into your CF card for your embedded project. I start to have a look into Monowall when my boss bring this machine into our office, an embedded box, Axiomtek NA-0042B. I couldn’t find any technical spec in detail of the product, even from the official Axiomtek website. So, in my case, I’m using a generic-pc image, from one of the monowall mirrors. I load the image into another vmware virtual machine, load the image into a secondary image of the machine. The disk is available for download here Monowall Disk for VMware. I’ve also prepared a complete vmware machine with monowall. Please download it here, Monowall VMware Image.. This machine have been configured with IP 192.168.1.254. Username & password are the same as default, admin and mono respectively. [download(Monowall Disk for VMware)] (5.4MB), [downloadcounter(Monowall Disk for VMware)] downloads. [download(Monowall VMware Image.)] (5.4MB), [downloadcounter(Monowall VMware Image.)] downloads. While figuring out how to manage my pics, and easy insert into my blog post, I found this plugin. Picasa LigthBox 2. This plugin will retrieve our public pictures from picasa gallery, and have an easy interface to include them into our blog post. Besides, it provides a overlay preview to our users, using WordPress Lightbox Plugin. Just put the WordPress Lightbox2 plugin into your wp-content/plugins/, activate it in WordPress Admin page. Do the same thing for Picasa Lightbox 2 plugin. Put into your plugin folder and activate it. After that, you can see a small button to add new picasa photo. You might develop a website for your client using WordPress, and want to customize the login page. There are a hacks to modify custom login screen at BinaryMoon, but they also develop a custom login plugin to make your life easier. Just place the plugin into your wp-content/plugins folder, activate, and you already have a custom login screen. You can use different background image for the screen, by uploading it to wp-content/plugins/bm-custom-login/images folder.